A mobile ad hoc network (MANET) is a decentralized type of wireless network, characterized by a dynamic topology. 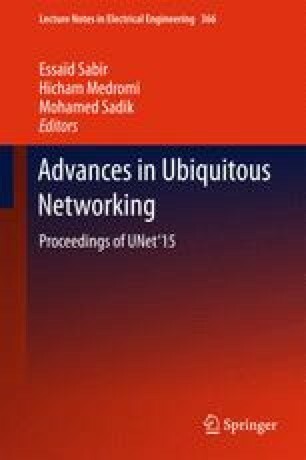 Supporting appropriate quality of service for mobile ad hoc networks is a complex and difficult task because of the bandwidth constraints and dynamic nature of the network. A routing protocol has a significant role in terms of the performance. It is used to discover and to establish correct and efficient route between a pair of source and destination nodes so that messages may be delivered in a timely manner. In this paper we have done the study of OLSR (Optimized Link State Routing) protocol. The key concept used in the protocol is that of multi-point relays (MPRs), which are selected nodes that forward broadcast messages during the flooding process. The objective of this paper is to examine QoS constraint in OLSR protocol. We present a state-of-the-art review and a comparison of typical representatives OLSR extensions, designed to enhance the quality of service in the original OLSR. The report aims to create a taxonomy of OLSR extension’s with QoS support on the basis of the nature and the number of the metrics used to adapt the protocol to QoS requirements.